The Universe always brings fellow food lovers across my path, so randomly running into Ben Justus on the streets of San Diego was no surprise. We connected over our love of a good steak and the Oysters and Pearls from The French Laundry. And then he told me about EGBOK: Everything’s Gonna Be OK, a non-profit he founded based in Cambodia where they train underprivileged young adults to be the hospitality leaders of the future . Using food to help break the cycle of poverty? Yeah, I’m here for that. 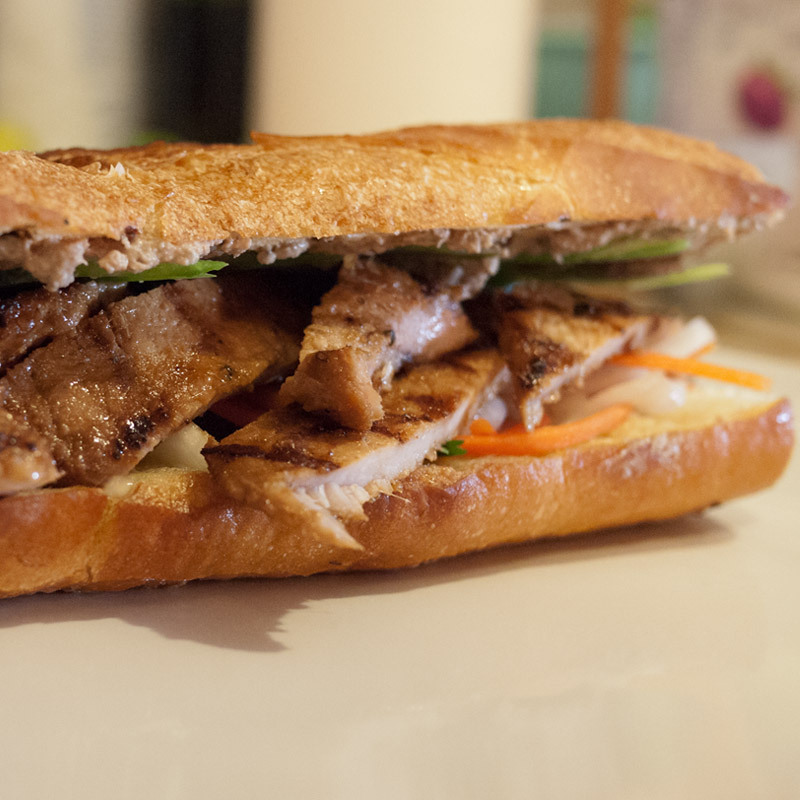 I knew I wanted to help and, in turn, learn about Cambodian food, which I’ve never made before. Come to think of it, I don’t think I’ve eaten much Cambodian food at all. To raise funds, EGBOK has developed a Dinner for a Cause Host Kit. 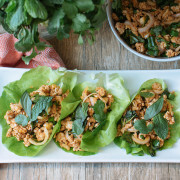 This step-by-step guide has everything a host needs, from a planning timeline to detailed recipes, to throw an intimate dinner party that can both raise awareness, raise funds and share traditional Cambodian culture through food. Interested in hosting a party for EGBOK? Want to sponsor a student? Learn how you can help here. I wish I had a space big enough to host a dinner part, but unfortunately, like my kitchen, the rest of my home is also impossibly tiny. 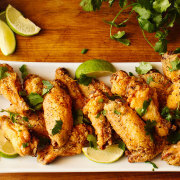 I’m helping spread the good word of EGBOK through FMITK with this addictive recipe, developed by students of the program! 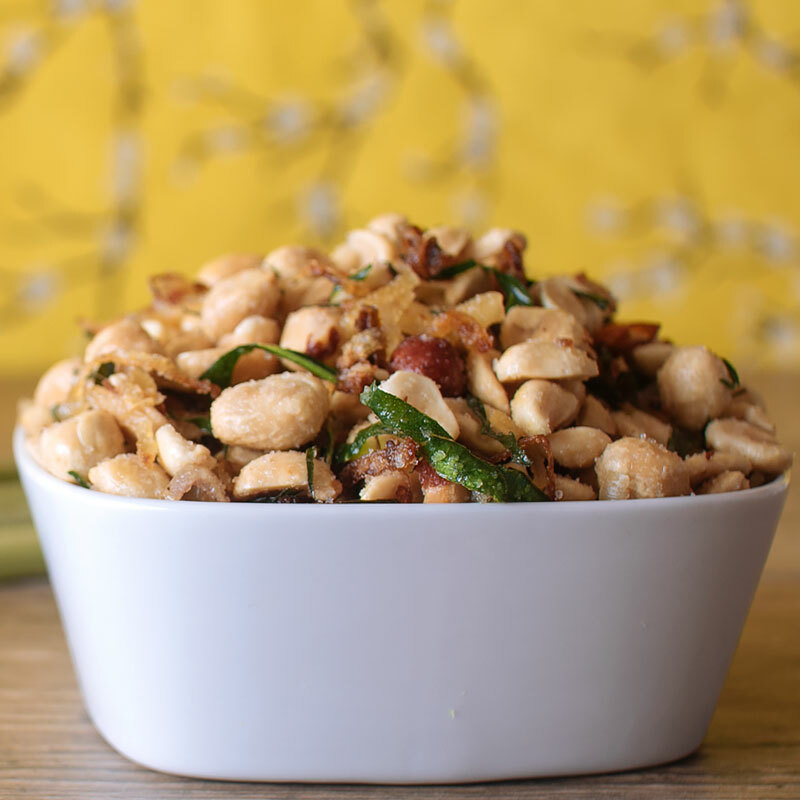 These fragrant and spicy peanuts were developed by in a recipe workshop where students worked in teams and voted on their favorites. I think it’ll be your new favorite, too. I had to stop myself from eating a bowl of peanuts for dinner. Find EGBOK Mission on Facebook, Instagram and Twitter! BTW, some of these ingredients may seem “albino eagle feather” and “eye of newt” to you, but you can find them in Asian grocery stores pretty easily. San Diegans, 99 Ranch or Zion Market has everything you need. 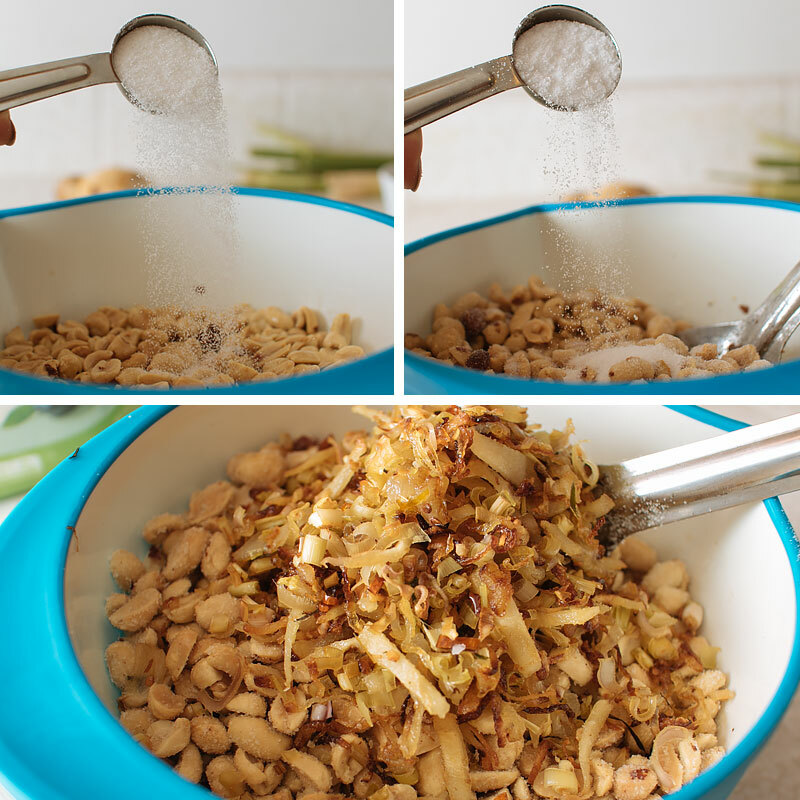 You’ll need salt, sugar, roasted + unsalted peanuts, lemongrass, galangal, Thai chilis, kaffir lime leaves, and an onion. 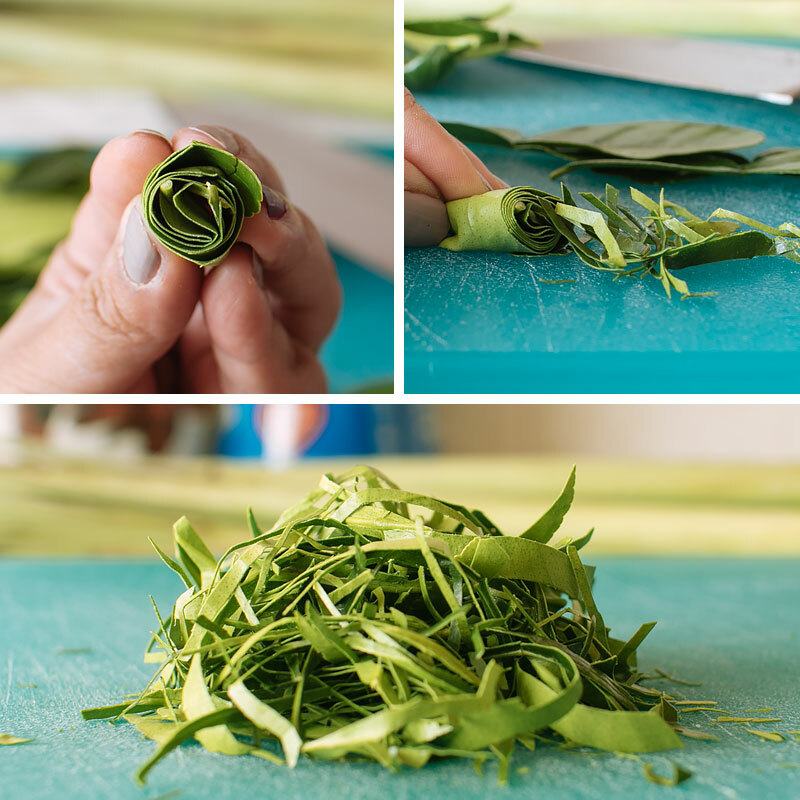 Cut the kaffir lime leaves into thin strips. The easiest way is to roll them up in a little bundle, then julienne. 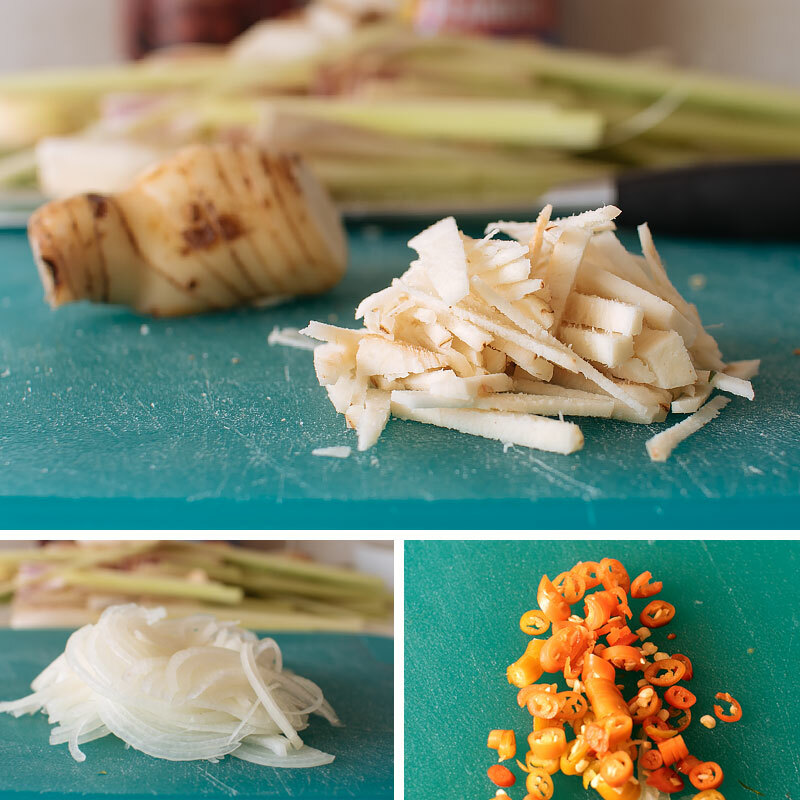 The easiest way to tell where the tender parts of a piece of lemongrass begins is to bend it in half. 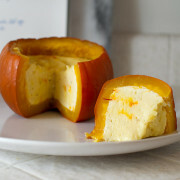 Cut there, then remove any tough outer layers to reveal the tender white part. Slice thinly. Cut the galangal into matchsticks; be sure to use a sharp knife – galangal root is a little woody in texture and can be tough to cut. Slice the onions and the Thai chilis. …and fry until just crispy. It should only take a few seconds. Drain on paper towels and season with 1/2 tsp salt. Set aside. 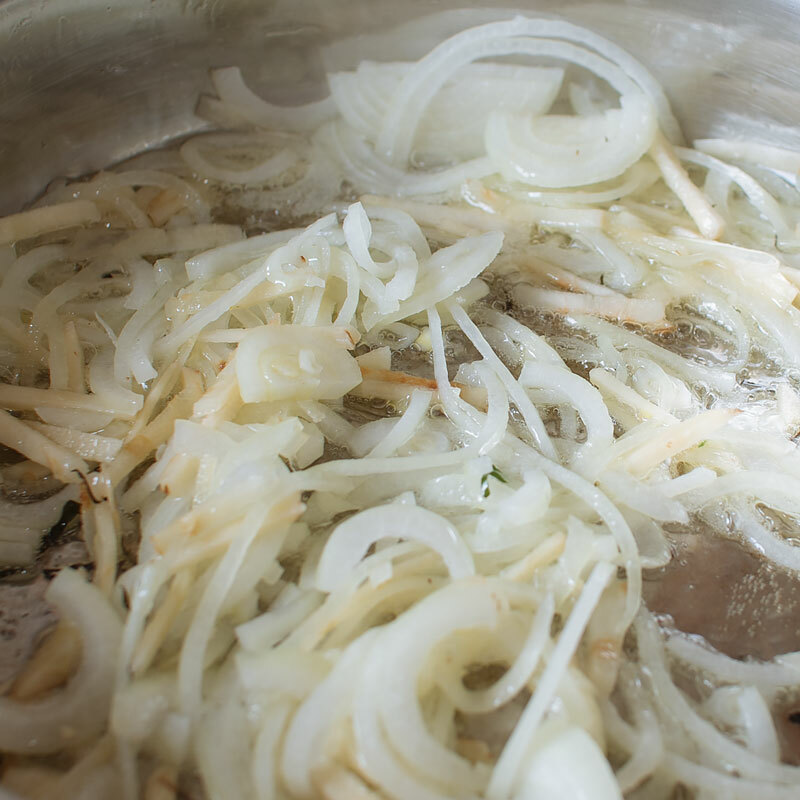 In the same pan, add the onions and the galangal and saute until softened, about 3 minutes. Add in lemongrass and chilis and cook until the veggies begin to crisp up, about 8-10 minutes. 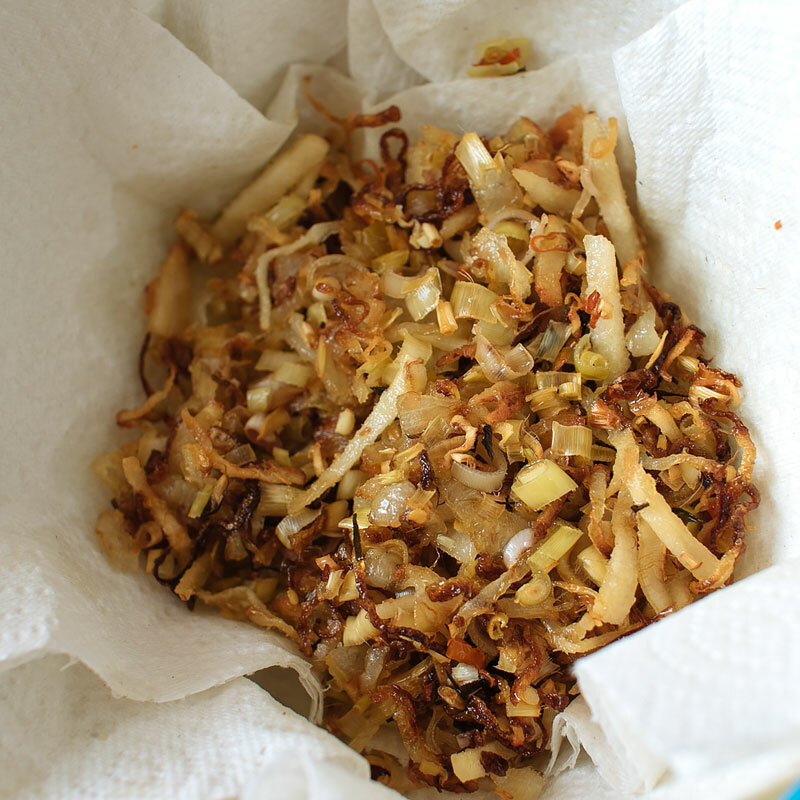 Let the crispy vegetables drain on paper towels. 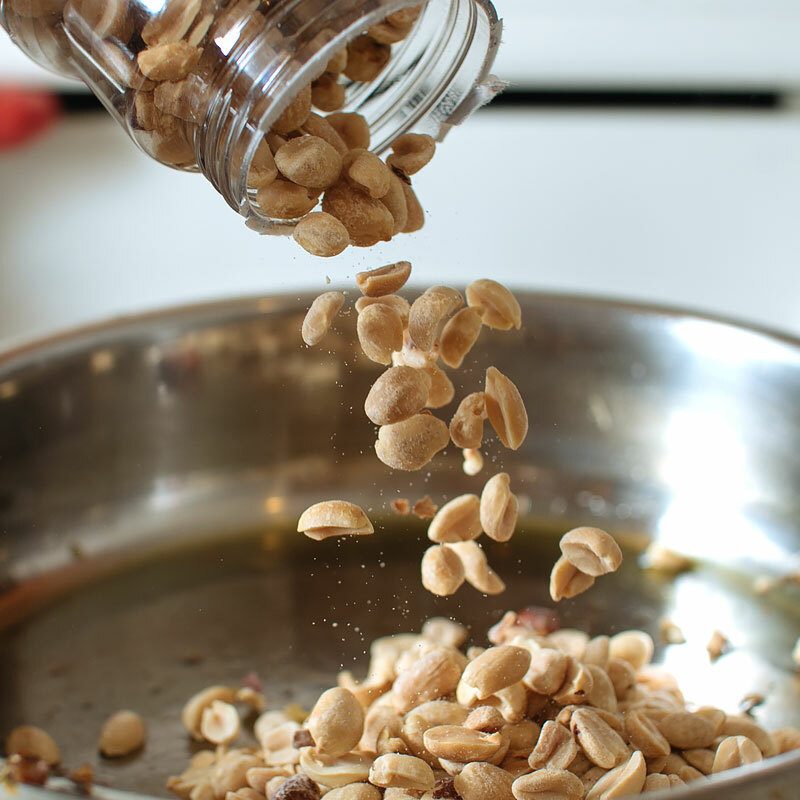 Toss the peanuts in the pan with the flavored oil for a few seconds, then drain on paper towels until most of the oil is gone. Season with 3 tbsp of sugar and 1 tbsp of salt. Add in the crispy fried vegetables and stir to combine. Taste, and adjust seasoning as necessary. 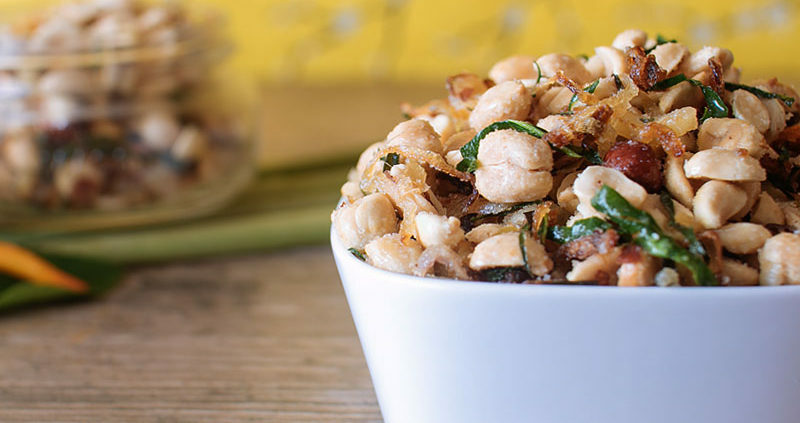 Finally, add in those super tasty crispy kaffir lime leaves and toss to combine. That’s it! 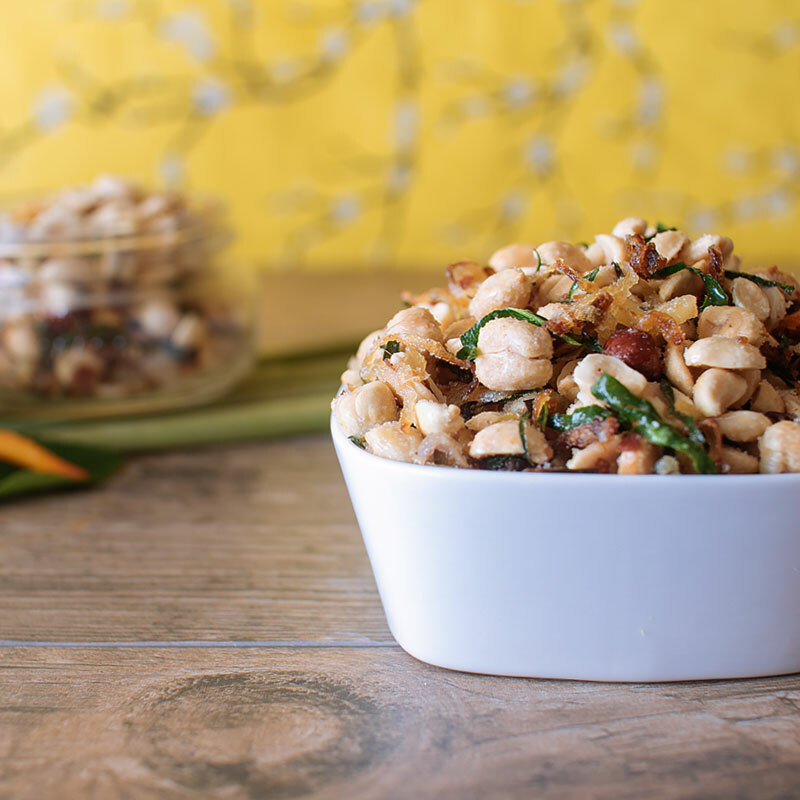 It’s my new favorite snack (Confession: I almost made it my new favorite dinner and had to stop myself from eating a bowl of peanuts with a spoon like a bowl of cereal. True story.). 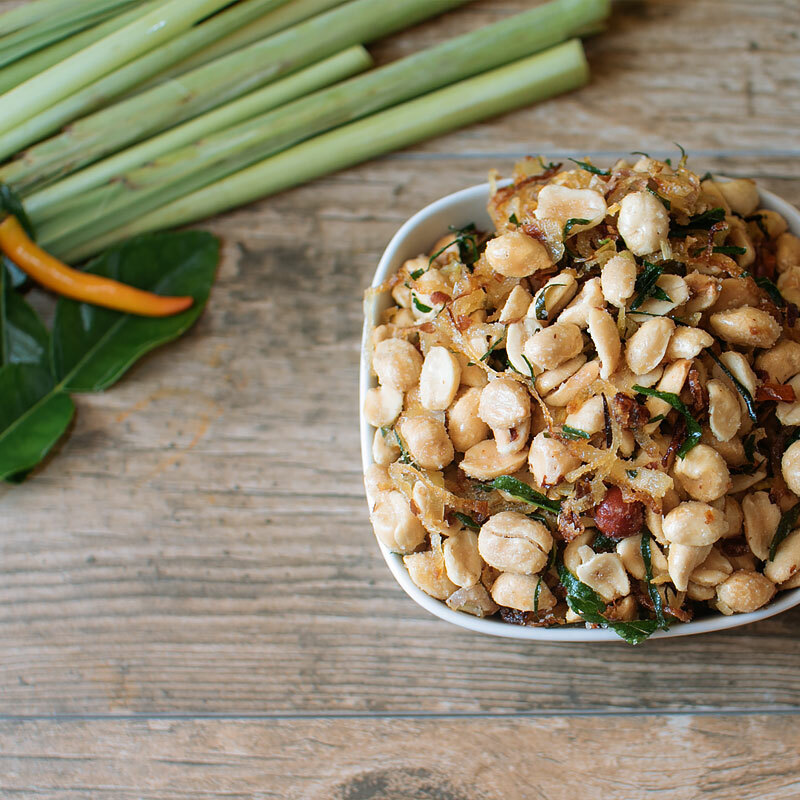 Pungent lemongrass, crispy onions and the spice from the chilis make these spicy peanuts pretty addictive. Recipe courtesy of and © EGBOK. EGBOK Students attended a workshop by Dana Beninati, a recent Hotel MMH Cornell University graduate. 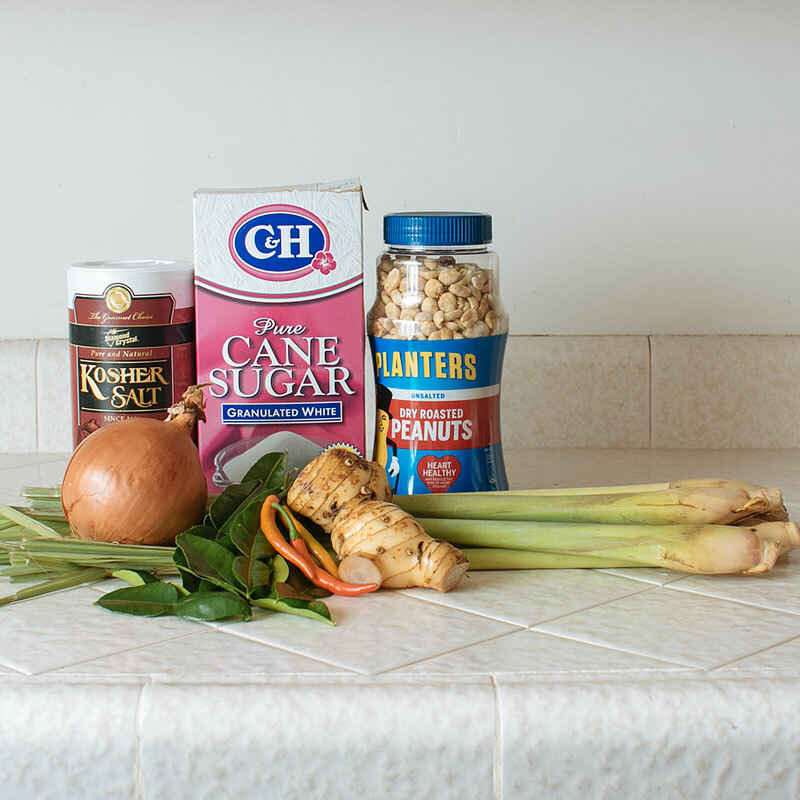 Students first learned best practices for recipe development and then worked in teams to create the winning EGBOK Fragrant and Spicy Peanut recipe. 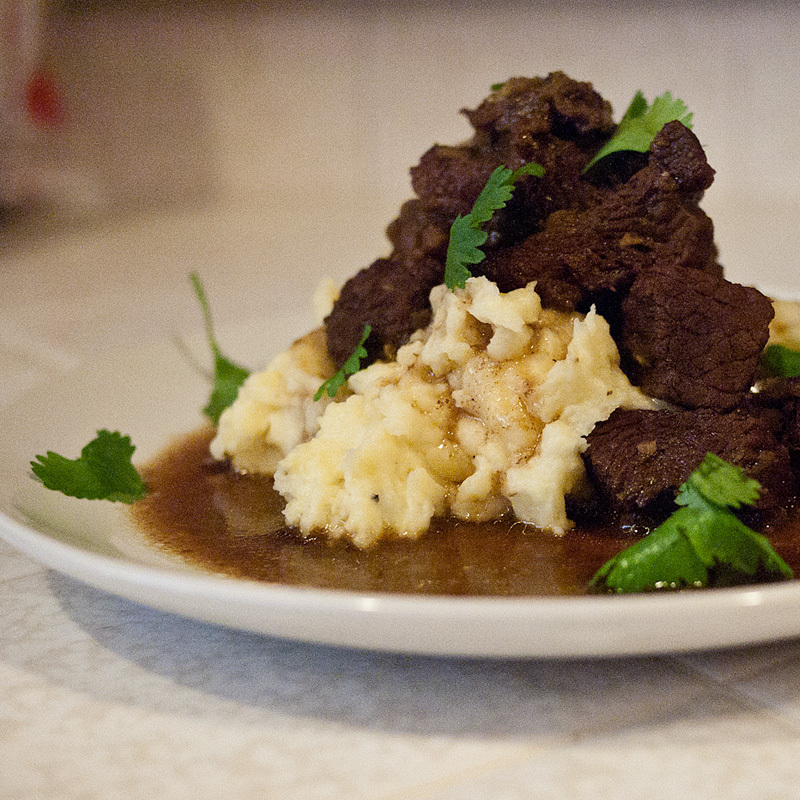 Enjoy this was the winning recipe! 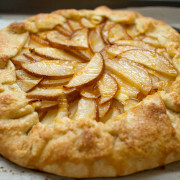 Delicious with Champagne or Prosecco. This recipe © EGBOK. Heat oil so it is shimmering but not super hot. 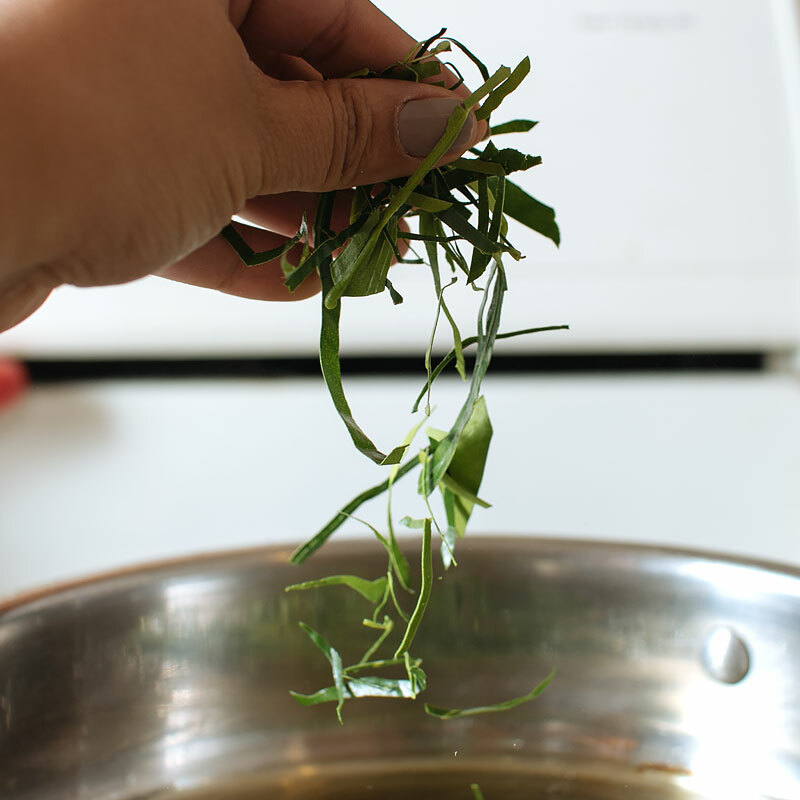 Put in a strand of lime leaf – it should become crispy but remain green. If the oil is too hot, and leaf becomes brown, reduce heat. 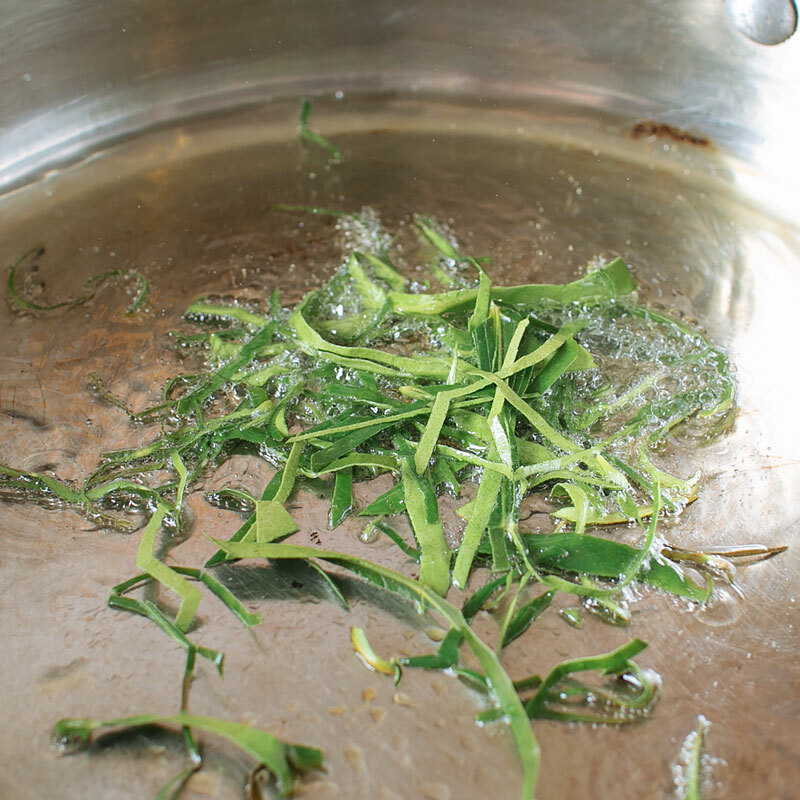 Add the rest of the lime leave strips and fry until crisp but still green – takes under a minute! 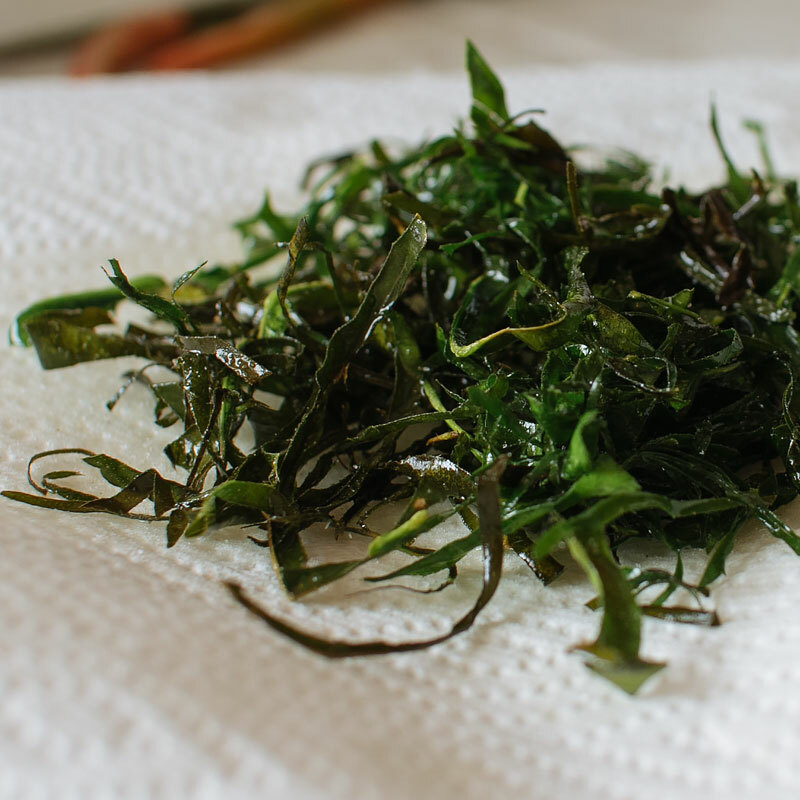 Ideally, using a skimmer (or strainer) remove leaves. Drain on paper towel, season with 1⁄2 tsp salt,; gently pull strands apart with fingers. 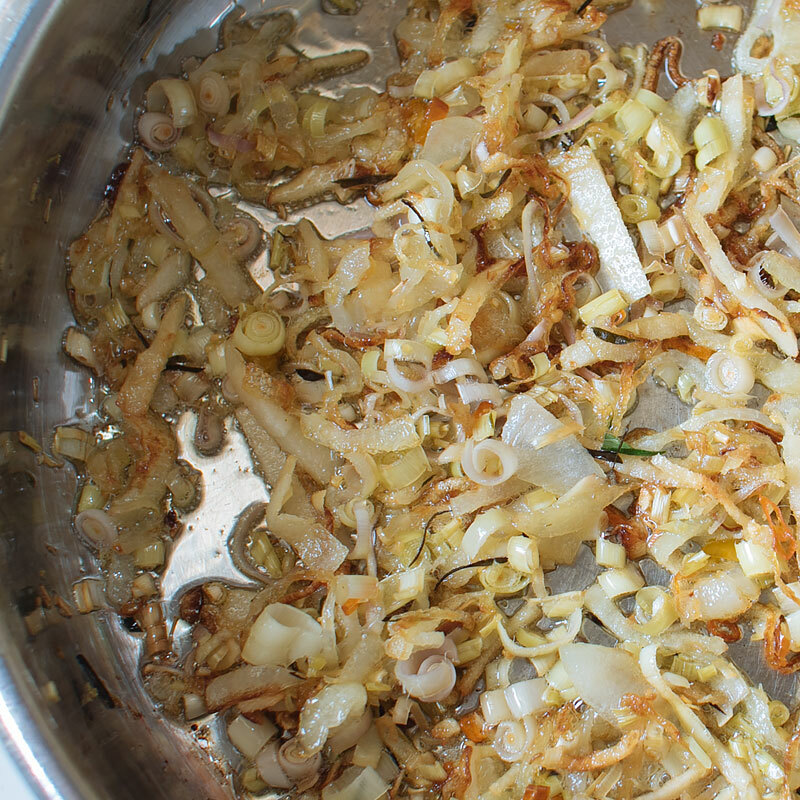 In the same pan with the hot oil, fry the onions and galangal until softened and fragrant, about 3 minutes. 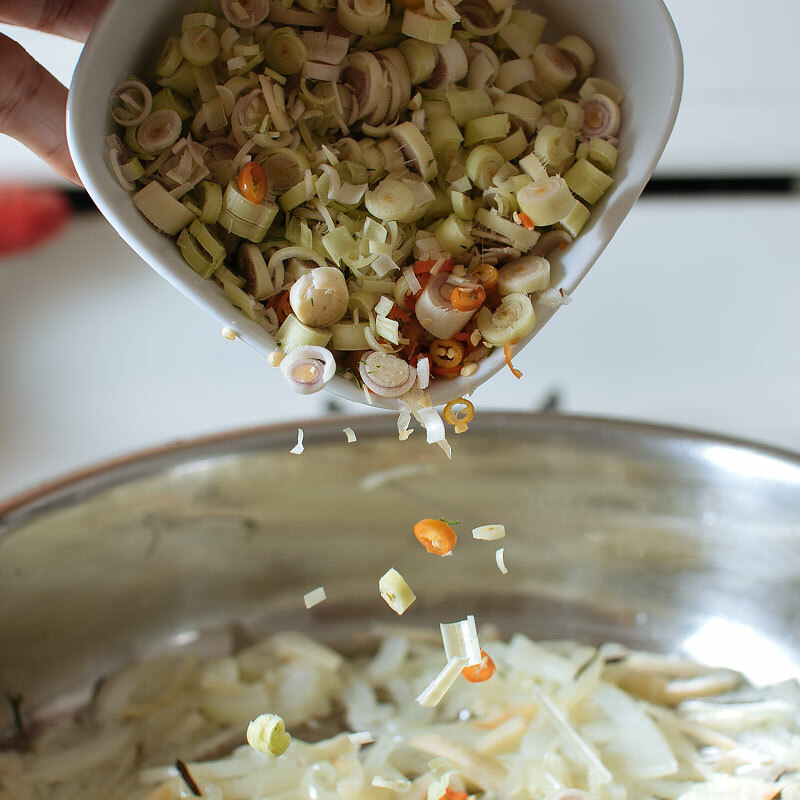 Add the lemongrass and chili. Cook until all vegetables are fairly crispy. Season with 1⁄2 tsp salt and set aside. Heat peanuts in the oil briefly and remove. 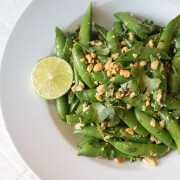 Toss with the crispy vegetables (except the fried lime lime leaf strands) and season generously with sugar and salt (3 parts sugar:1 part salt). Keep replacing paper towels until nuts are less oily. 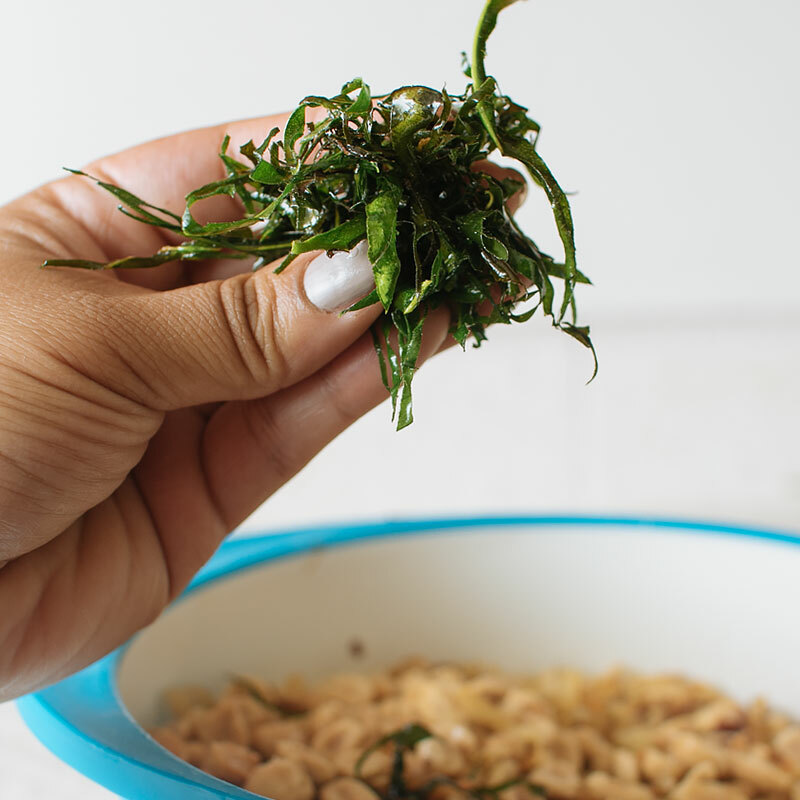 Once seasoned, add fried lime leaf strands, toss. Taste and adjust to your liking! 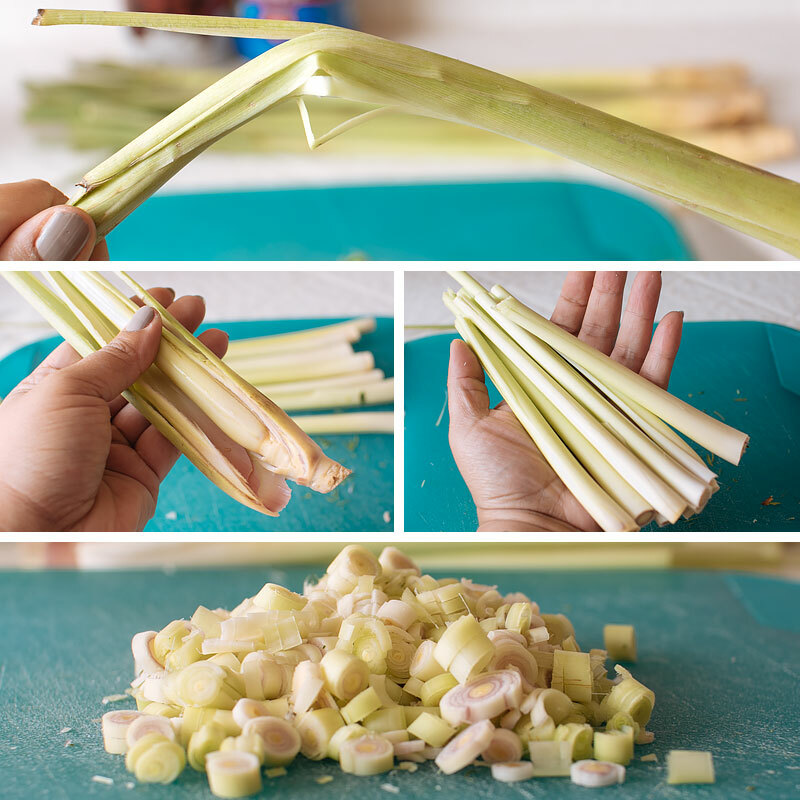 Using Lemongrass – bend a stalk and see where it naturally breaks. Use the white part of the lemongrass but be sure off the entire woody end. Galangal is in the ginger family but has a much more pungent, complex spicy flavor that mellows a bit when cooked. It is woodier in texture than ginger, so be sure your knife is sharp. If you have rubber gloves, wear them when dealing with the Thai chilies! Once you are done with the oil, don't throw away!!! It is now a wonderfully flavorful oil you can use to sauté the chicken patties or any other dish for that matter! What an interesting snack! Love these peanuts!